Making 60 The New 40! As an internist (A.K.A. adult medicine doctor, primary care provider), one of the best things about my job is variety. My youngest patient is 17; my oldest patient recently passed away peacefully at 104 and 4 months! I believe strongly that it’s never too late to make healthy life changes. NEVER! Using myself as an example, I was starting to get the creaks and groans of arthritis in the morning. Hours on the computer at the office were causing my shoulders to hunch forward, and I was starting to notice that I wasn’t as strong as I used to be, which is a sign of the natural loss of muscle mass that is especially bad for women as they age. While I’m well aware that all of your medical specialist should be board certified, I did not know how important a personal trainer’s certification is! Some trainers have literally only a few hours of training and do not know the physiology of the human body well enough not to seriously hurt you! So now that we’ve spilled some knowledge on ya about this topic , let’s spill a little more with an expert in the field! Dr. Nolfo: Thanks for sitting down with me today Steve. Can you tell our readers what it means to be a certified personal trainer and why it’s so important for your clients? Steve Cioppa: Your trainer should be certified by a nationally recognized organization such as NATIONAL STRENGTH AND CONDITIONING ASSOCIATION (NSCA) , THE AMERICAN COLLEGE OF SPORTS MEDICINE (ACSM) , THE AMERICAN COUNCIL ON EXERCISE (ACE) or THE NATIONAL ACADEMY OF SPORTS MEDICINE (NASM). A certified trainer will have rigorous training and also ongoing requirements for continuing education to maintain certification. There are many additional specialized certifications trainers can get on top of this – for example, I am certified to train with TRX – but they need the solid background. Dr. Nolfo: Steve, what should the trainer do for you? Steve Cioppa: As you get older, the focus should be on functional strength and fitness. Not only should your trainer be able to help you make your daily life tasks easier, you should be able to advance far beyond that and increase your ability to garden longer, shovel snow easier or improve in any sport you play. One of my 60+ year old clients was upset with me because he had to change all the clubs he used for golf after he added 20 yards to his golf swing! Steve Cioppa: Your trainer should have the skill simply to look at your posture and tell which of your muscles are weak and underused and prescribe corrective exercises to balance your body. This can eliminate a slew of unnecessary pains and limitations. I always recommend stretching the hip flexors and strengthening the posterior muscles. Steve Cioppa: Look at the diagram of Upper Cross Syndrome. In this case, I would work on strengthening the rear shoulder muscles and stretching the chest area. Dr. Nolfo: Thank you so much for all the useful information! I will say, working with a personal trainer is without a doubt the best decision I’ve made in this stage of my life. Last night my daughter’s rock band played a gig and afterward we helped her bring her drums to the outside of the club. I snatched up a heavy cymbal bag and two drum stands like it nothing was nothing and I realized I could not have carried them so easily last year! It was a pretty empowering feeling. Steve Cioppa is a NSCA Certified personal trainer / TRX certified trainer with over 20 years of experience. He can be reached at 203-767-5899 or SCperc@hotmail.com. Work with a trainer? Think about it. As always, the information I have posted for you here is completely unsolicited – I have no financial ties with Steve! ← Fighting Bad Cholesterol With GOOD Methods! 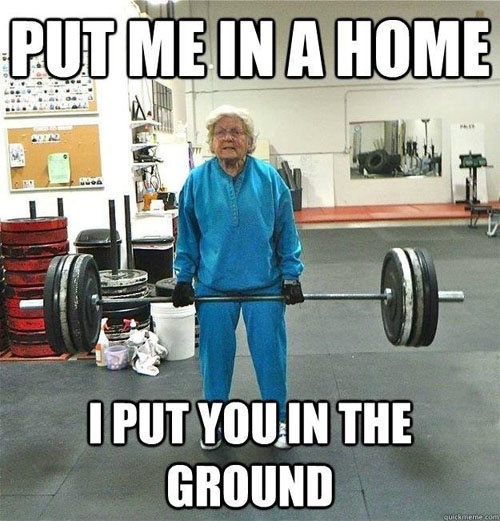 She reminds me of Supergran! I thought it was quite appropriate for this post, very funny! Thanks for reading!!! !